Why Choose A Pilgrim Sumo? What tools and Skills will I need? Cost of Building a Sumo?? Stage 3 - Body Work.. Fairly simple to fit, it just pushes on the return on the sill around the door, you will need to trim the return to the correct length so that the rubber pushes on nicely. Its a good idea to fit this at the same time as you are doing the carpets to ensure you get a nice tidy finish around the rubber and carpet and can trim the fibreglass return to exactly the right length. To make it all nice and tidy, at one end you fit a metal finisher. This is refered to as DTEF on the Pilgrim parts list. Its a shaped stainless angle that is used at the rear of the door seal to hold the seal in place and give it a nice finish. 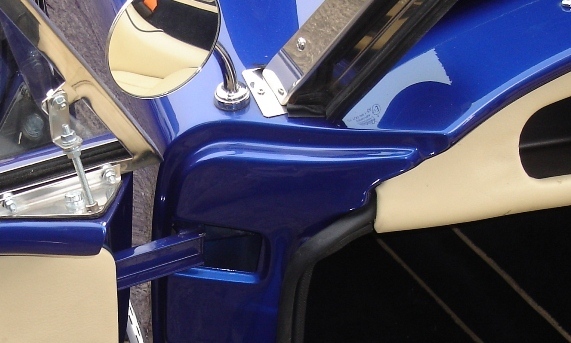 I found that the supplied part was a bit of an odd fit and so modified it by removing the lower angle and repolishing, a picture of the modified part fitted is shown below. Its held in place with a couple of stainless cap-heads. At the other end the rubber is covered by the end of the dash, here's a picture of the Pilgrim demo car dash.